Stages of Grief: Heart In Diamond is changing lives with faster production of memorial diamonds that are cost effective and offered in a wide range of colors. After a loved one passes, some psychologists believe that the grieving family and friends left behind will go through five to seven stages of grief. They believe that these stages can have a profound effect on how we process and recover from the loss of a loved one. We all go through similar experiences, regardless of the order in which they occur, or the length of time that they last, because we all carry the same emotions when we lose someone close to us. Twitter account @MindMatters explains that the stages seem to take a person from a loss-hurt phase to a loss-adjustment phase as pictured below. One of the most important things to remember is that it actually doesn’t matter which stage of grief mourners are experiencing when immersed in thinking about the loss of their loved one. It’s not as if they wake up one morning and realize they’re in the denial stage and the next week they recognize that they’ve moved onto bargaining. It’s been shown that grieving is not a linear experience, nor should it be – each experience of loss is as individual as the loved one being mourned. Heart In Diamond has a large selection of memorial diamonds that can provide solace and allow you to remember your loved one in a manner that is right for you. Remembering your loved one can be difficult at any time but it can be even harder for your mind and body to accept when going through the stage of denial. Psychologists who believe that denial is the first stage of grief, attribute this to the idea that as a human, you are programmed to believe that death will not happen to you. Denial acts as an emotional protection until you are ready to begin process the pain. A memorial diamond can provide a sense of comfort if someone is experiencing denial. A remembrance diamond, which can be created before your loved has passed, allows you to share the creation with them before they pass away. This means that even if your mind is finding it difficult to process what has happened, you can take comfort in the fact that your loved one will be with you as you experience the emotions commonly labelled as the grieving process. Pain is considered a common part of the process and often represents the overwhelming emotions people can experience. It’s a commonly held belief that pain occurs as a result of people beginning to process all of the emotions they’ve been suppressing after a loved one passes on. Some experts claim that accepting this pain is an indication that you are accepting your grief. Remembrance diamonds act as a physical reminder that even though you may be experiencing large amounts of pain, part of your loved one remains with you. It can be difficult to know what do with ashes once you bring them home. Rather than leave them sitting in one place gathering dust, transforming them into cremation diamonds means that your loved one can accompany you wherever you go; the diamond acting as a reminder and comfort of the person who had such a huge impact on your life. It can be difficult to be surrounded by constant reminders of your loved one’s life and this can result in feelings of anger relating to the fact that they’re no longer with you. Some people make the mistake of giving away all of their loved one’s belongings because they’re so hurt or upset when looking at them. However, giving the possessions away can still result in feeling alone or even regretting what they’ve done. A memorial diamond is something that can be kept forever and will always carry a special meaning. If it makes things easier, it can be purchased and put away until the anger passes and the person mourning feels ready to embrace the memory of their loved one who is no longer with them. Sometimes people negotiate with themselves and their spiritual side to try and understand what has happened. This is what some term the ‘bargaining’ phase of grief. Bargaining is another aspect of the grief process. It’s a common emotion experienced by people who are dying. This is where the creation of a cremation diamond that can be made before the person passes away can be of great benefit. Heart In Diamond cremation diamonds can be developed in 70-120 days, after the color, clarity and carat have been chosen, allowing the person facing death to leave a precious legacy for their loved ones. Guilt is another common emotion experienced and is thought to be due to feelings of unresolved issues or a broken relationship with the person who has passed away. Guilty feelings can arise when people think about past fights or negative encounters with the person who has passed. A memorial diamond can counter this by acting as a reminder of the happy, positive times shared with your loved one. The main purpose of a cremation diamond is to remind you that the person you loved, cared and loved you deeply in return and that no fight or disagreement will ever change that. Converting ashes to diamonds allows you to solidify your loved one’s place in your life and heart forever and help with acceptance of their death. Acceptance can come in many different forms such as accepting that your loved one has passed on, accepting that you have been left behind and accepting that a new stage of your life is beginning. 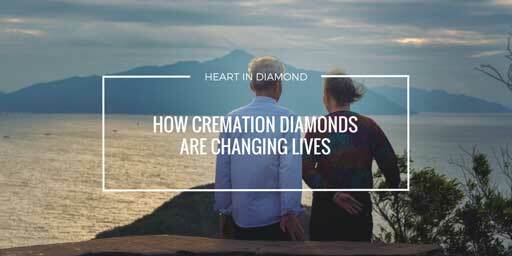 Cremation diamonds are an acknowledgement of your wish to keep your loved one with you forever. It’s never easy to say good-bye and the process of deciding what to do with your loved one’s ashes can be extremely difficult because of the varying emotions felt as a result of their passing. Even though we’ve discussed the various emotions of grief in a linear manner, mourning the loss of a loved one and coming to terms with their death is never easy and never that simple. It’s common to cycle amongst emotions, experiencing different things at differents times and even much later, when you think you’ve come to terms with things, for grief to return in the form of various emotions. Heart In Diamond is helping to transform the way that grief is processed by allowing families the opportunity to honor their loved one by keeping them with them at a time when they most need to be reminded of the love shared between them. Twitter handle @TabithaHealth provides a brief illustration of how grief can be processed in five stages instead of seven. 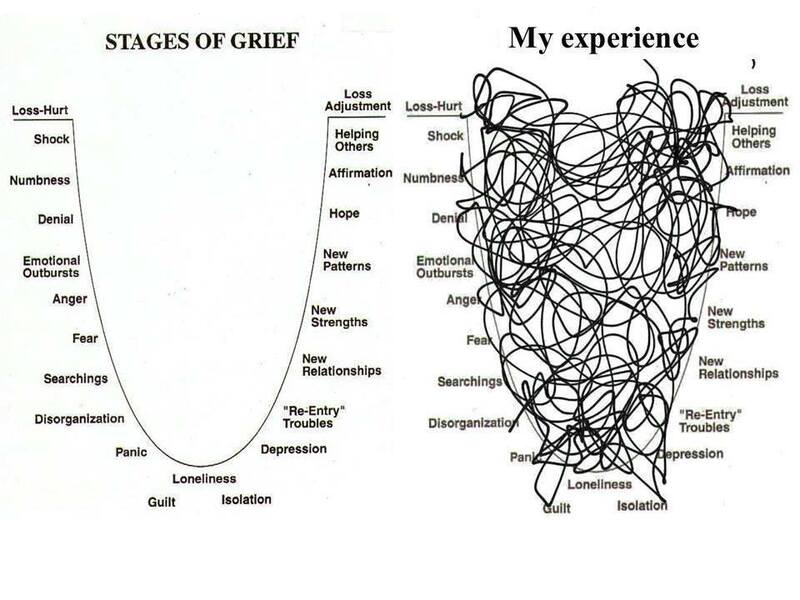 Regardless of how many stages there are, or what order they’re experienced in, what’s important is to grieve in a way that’s right for you. Regardless of the form your grief takes, a memorial diamond can help with processing the loss of your loved one by keeping them to close you always. Counsellor Kay Bruner provides a humorous look on how differently grief can be processed by each person.